February is National Dental Health Month, an excellent time to pay extra attention to your pet’s oral health. According to the American Veterinary Medical Association: Periodontal disease is the most common dental condition in dogs and cats – by the time your pet is 3 years old, he or she will very likely have some early evidence of periodontal disease, which will worsen as your pet grows older if effective preventive measures aren’t taken. Just like with humans, periodontal disease begins when plaque and tartar build up on teeth and under the gumline. Without regular brushing or use of dental hygiene products, such as enzymes that help prevent the build up of plaque, oral problems can take root. Obvious signs of periodontal disease in pets include bad breath, swollen gums, red gums (healthy gums are pink), bloody gums, dark yellow or brown teeth, nasal discharge, trouble eating, and wincing when touched around the mouth. Periodontal disease can affect more than just the mouth. It can have a detrimental affect on several organs. Dogs and cats with periodontal disease are more likely to exhibit issues in the heart, kidneys and liver. Periodontal disease can also affect immunity. Bacteria can enter the blood through inflamed gums and exposed blood vessels in broken teeth. As the bacteria circulate, it can cause inflammation in the lymph nodes. Then while the immune system tries to manage the bacteria and inflammation, white blood cell production and movement throughout the rest of the body may be inhibited. This means that the immune system may not be able to address other issues, such as stress, protecting the body if pathogens are present, fighting irregular cells and other vital functions. 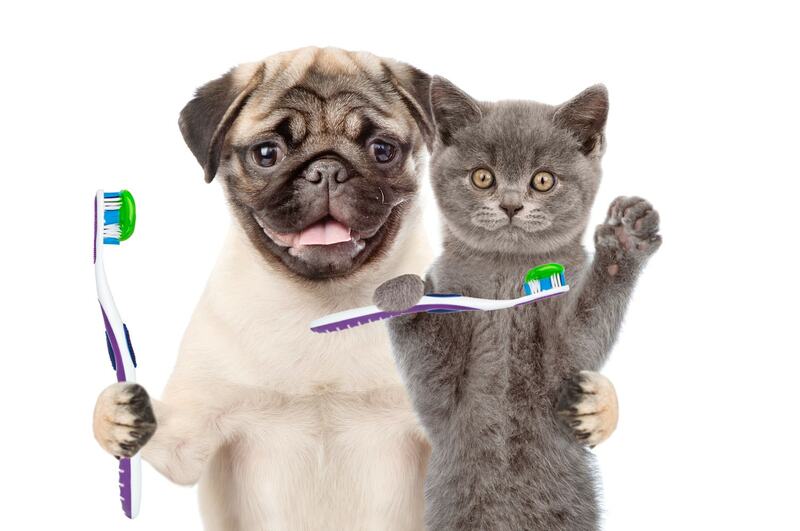 As you can see, pet dental hygiene is integral to their overall state of health, and including Treatibles organic full spectrum hemp oil as part of your pet’s daily routine can help. For pets suffering from periodontal disease, rubbing Treatibles organic full spectrum hemp oil featuring naturally occurring CBD on the gums can offer relief. Using the oil both topically and internally offers additional benefits as the oil promotes the body’s normal inflammatory response and supports the immune system. Pet parents may also consider an unorthodox option of brushing their pet’s teeth with our full spectrum hemp oil, which is in a base of organic MCT coconut oil. Coconut oil is well known for its antiviral, antibacterial and antifungal attributes. Though our full spectrum hemp oil is great for supporting health, Treatibles encourages annual veterinary visits that should include an oral exam.